Genuine Bosch replacement 5.0Ah Lithium Ion CoolPack Battery which gives you up to an extra 25% in runtime when compared to the smaller capacity 4Ah battery. 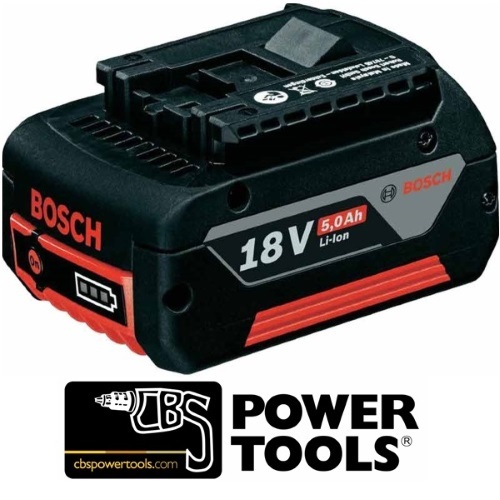 Bosch state that the CoolPack technology built into these batteries can increase the working life of these batteries by up to 100% when they have put them up against other standard lithium ion batteries currently in the market. This battery is fuly flexible and can be used with any of the 18v Bosch Cordless system of Power Tools. The 3 stage built in LED guage lets you keep an eye on how much battery life you have left so you should never be cut short without any notice.